The Flyt Stᴉk from FlytLab will not hit the market until early 2019 but they hit us up for a real, no-BS take on their product before it reached the masses and we were happy to give it a solid test run to see what the cutting edge of vaping can offer. If you are not familiar with this brand, you’re going to want to get familiar. For those of us who have strolled the showroom floor at events like CHAMPS or BIG, you may have seen their blacked out booth tatted top to bottom with chainlink and brilliant branding. They close their space in, forcing you to step inside to see what’s good and I always liked that – it intimidated the goofballs and weeded out the riffraff. But what really impresses me about this crew is that you’ll always find the owners and founders of the company standing right behind the counter educating clients face-to-face about their product. Vape pens are rarely interesting with a vast majority of them being knockoffs of each other, but FlytLab proudly stands behind their unique product line. 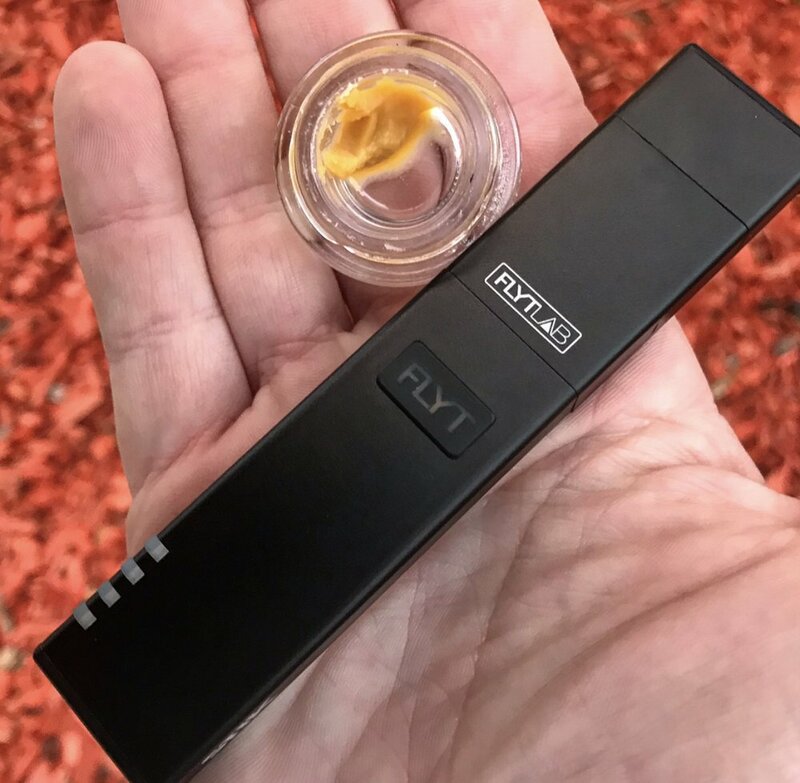 In the past, they were focused primarily on the herbal vaping experience, but this latest product – The FlytLab Stᴉk - is intended for vaporizing concentrates with a goal of providing an affordable and effective handheld vaporizer for everyone from the entry-level user to the true cannabis oil connoisseur . . . so we put a beating on it and ranked it 1-10 in each category, and here’s what we came up with. First impressions matter and FlytLab’s sharp black and white branding lures the eye right in. In fact, that is probably one of the main reasons that they never get knocked off is that their packaging alone would be a nightmare to try to reproduce. I felt like I was unboxing a Rolex or something as I removed layers of well-packed and smartly displayed pieces, parts & accessories. 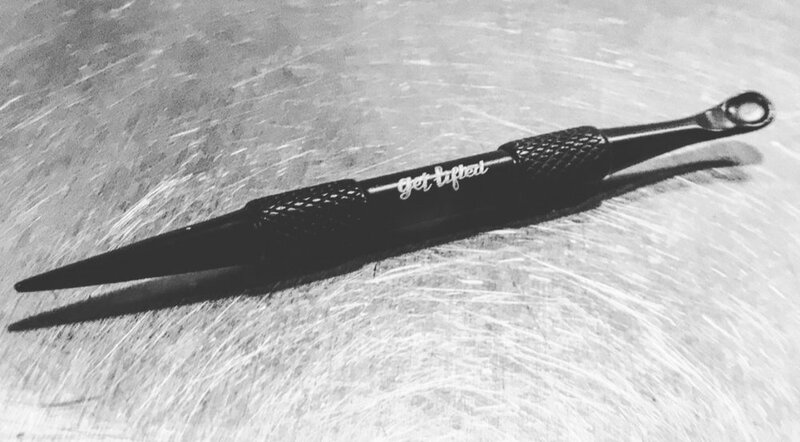 *Side note – This multiuse dabbing tool is so handy. It’s perfect for loading the FlytLab heating chambers, but I also use it to scoop kief on bowls, poke down my buds when rolling a J, and more. I love this thing! You don’t need to be a rocket scientist to operate most vape pens, but that is because most vape pens don’t have many features. The FlytLab Flyt Stᴉk offers an ideal blend of options and ease of use that is sure to appeal to new users and seasoned heads alike. Roughly the size and rectangular shape of a pack of Hi-Chews, the Stᴉk slips comfortably into pocket or purse and stays put right where you set it. With no annoying threading to get gummed up, the Stᴉk features magnetic attachments for the charging dock, heating chambers, cap and mouthpiece that separate easily when you want them to, and stay securely shut when you need them to. I had some incredibly terpy Banana Pie hash oil from our boys at OkeTree Farms that has been amazing off of my quartz banger and dab rig, so I decided to use that flavorful wax for the comparison. The FlytLab Flyt Stᴉk comes equipped with two different heating chambers – the Ceramic Slab and the Dual Quartz. Both offer plenty of space to fill with tasty terpenes. You could probably safely fit at least a half a gram in either one if you wanted to, but I started with the Ceramic Slab and chucked in a modest amount comparable to a standard dab. The main difference between the two chambers is that the Ceramic Slab is intended for low-temp use, whereas the Dual Quartz chamber will reach temps nearly twice as high. Starting with the ceramic version, I made the mistake of smearing my oil around the upper lip of the chamber, instead of packing it further down inside. This led to my first few low-temp rips being pretty uneventful. But the FlytLab Flyt Stᴉk also allows you to easily choose from four different stages of heat. The Ceramic Slab can be set to 200, 250, 300, or 400 degrees Fahrenheit. The Dual Quartz, on the other hand, can reach temps of 400, 500, 600, or 650 degrees Fahrenheit. Four LED lights near the base of the pen indicate your current temperature level, and can also be used to determine how charged your battery is. So I cranked up the heat a bit and once that glob melted down to the base of the chamber I was treated to what I can only describe as a handheld dab. All the flavor I would expect from a clean, perfectly heated banger, carb cap, and rig was replicated for a solid 6-8 rips from my Flyt Stᴉk. The innovative mouthpiece on the Stᴉk depresses slightly with a gentle press from your lips. This creates a carb-cap-like effect in the heating chamber, lowering the atmospheric pressure within and allowing your concentrate to vaporize more thoroughly and at a lower temperature which preserves crucial terps and cannabinoids. Told you it was like a real dab! Both heating chambers offered an abundance of airflow - the ceramic produced more flavor, the quartz produced thicker clouds and a more immediate effect. There are two different vaping “modes” but there is only one button on the device. You press it 3x to power on the FlytLab Flyt Stᴉk. After that, the “Flyt Mode” only requires one push of the button and the Flyt Stᴉk will deliver a full 10-second heat and hit cycle before cooling back down. This auto-dosing feature helps to conserve your costly concentrates and will be useful for those new to vaping. The Stᴉk charges quickly (1.5 hours from dead to full) and can even be used while charging. The score gets dinged here a bit just because FlytLab is so original. All of their pieces and parts are exclusive to their product so it could be hard to find upgrades/replacements in a pinch, though the internet will have plenty once the product is launched. Vaping cannabis oil is predicted to become a leading form of consumption of the next decade, and too many new users will resort to the convenience of a pre-filled vape cart. 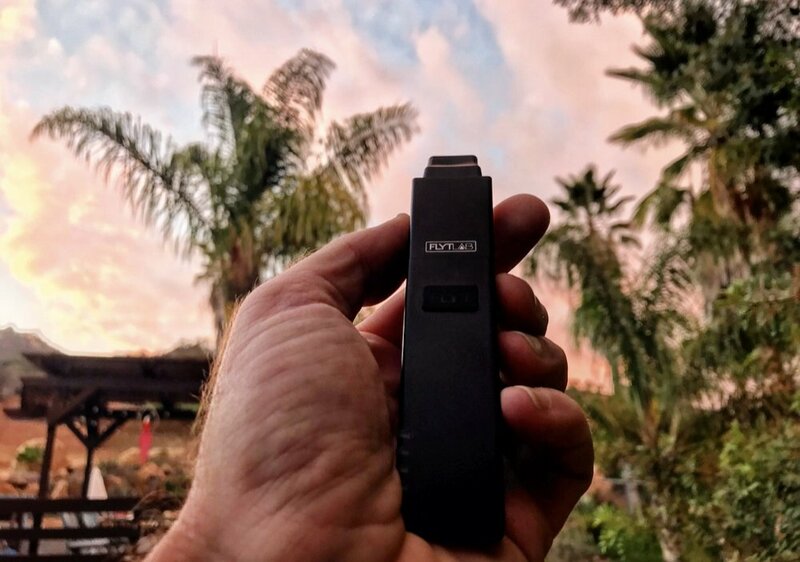 Those certainly have their use, but for those who want to know exactly what they are inhaling, and want the natural spectrum of terpenes and cannabinoids when they do so, the self-packed vape pen is the best option and the Flyt Stᴉk is the best one we’ve used. As FlytLab puts the finishing touches on their new website, the Flyt Stᴉk is scheduled to launch in early 2019 and will ship to retailers with an MSRP at or under $100. After several uses with both heating chambers, we can honestly recommend this product to any and all cannabis users who appreciate high quality gear. Wax, hash, shatter, budder, resin, rosin, crumble, sauce. . . whatever your pleasure, the Flyt Stᴉk will take you higher. Want to try one for yourself? Stay tuned to our Instagram page and Friday Sesh Newsletter for more details!